In May of 2014, Mariam Yehya Ibrahim was arrested with her 20-month-old son. She was sentenced to death for not renouncing her Christian faith. The judge declared, “We gave you three days to recant but you insist on not returning to Islam. I sentence you to be hanged to death.” Her story caught my attention not only because of her faith but while she was in prison, she gave birth to her second child. 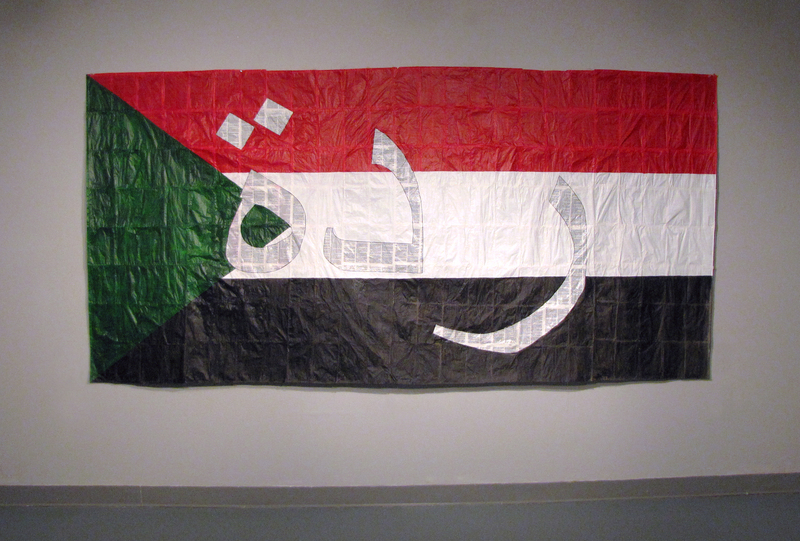 This piece is made from an entire King James Bible sewn together with the Sudanese flag painted on it. The word apostasy is written in Arabic and is without paint. This story has a good ending, later, the U.S. got involved because her husband is a U.S. citizen and she was released.